IdentityDirect.com offers personalized gifts for children including Adventure Books, School & Stationery, Pens, Pencils & Markers, Backpacks & Bags, Lunch Bags, Vinyl Labels, Jewelry, Home Essentials, Bedroom, Bathroom, Dining, Placemats, Children's Gifts, Clocks, Poems, Growth Charts, Toys, Educational Toys plus personalized books including Disney Characters, Cars, Disney Princess, Disney Fairies, Winnie The Pooh, Finding Nemo, Toy Story, Pirates of the Caribbean, Ratatouille, Dora the Explorer and Sesame Street. Always check back with 58Coupons to find the latest savings, promotions and coupons for IdentityDirect.com. Shop at IdentityDirect.com and get a 145 Piece Personalized Back to School Value Pack for only $19.99. Click link to start and use the coupon. Get 20% off personalized Disney gifts for your little ones with this promo code from IdentityDirect. Click link to save. Get 30% off your order of $50 or more at Identity Direct with this coupon code. Click link to enjoy this limited time offer today. 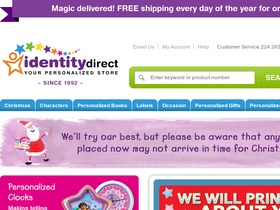 Check out IdentityDirect's Sale page for savings of up to 70% off. Backpacks, bathrobes, toys and more can be found starting at just $1! When you spend $20 or more at IdentityDIrect.com, you'll get $5 off your order with this coupon code. Click link to see code and save today.